Here is an opportunity to own a horse of a different color with a pedigree that screams jump. Gelato is by the cremello Thoroughbred stallion, Goldmaker - the only fully licensed and approved cremello Thoroughbred in the world. He is out of the classically bred mare, Paso Doble (Voltaire x Kimberley H/Burggraaf). 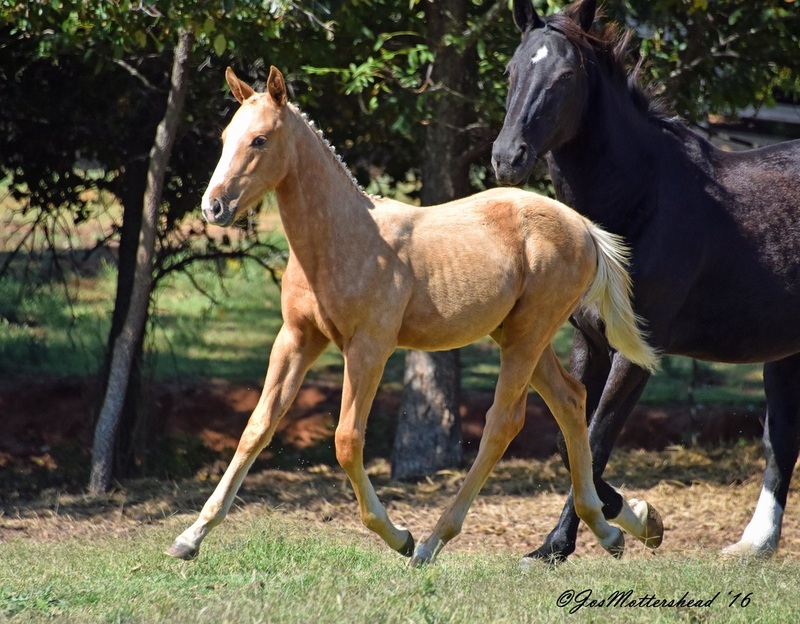 This colt is bred to PERFORM! And with the unusual golden coat, he will stand out in a crowd and get you noticed. Gelato's sire, Goldmaker, successfully completed his stallion performance test at Silver Creek in 2011. Throughout the 70 Day Stallion Test, Goldmaker proved himself to be enthusiastic and talented over fences, demonstrating beautiful bascule and lovely form. He received high marks for his rideability, character and temperament. He wowed ALL of the judges at the testing - both registry inspectors and testing judges - with his exceptional cross country ability. Gelato's dam, Paso Doble, is sired by the renowned Voltaire and is out of a mare by Burggraaf. Her bloodlines are jumping royalty! competed successfully in the Children's Hunters and Jumpers for most of her career. She had multiple wins in medals classes under multiple junior riders. This mare has proven herself to be an old soul with a kind and forgiving temperament. A beautifully conformed mare, she was awarded Premium with both the RPSI and the GOV at her mare inspection. With Gelato's extraordinary pedigree and kind, people oriented temperament, he should prove himself to be a superb performance horse. And with a pedigree that is 73% Thoroughbred, he would also be a competitive Eventer.